There are few things as important as helping employees and executives achieve confidence in their financial future. Accordingly, our BOLD Value team is keenly focused on a portfolio of powerful tax sensitive deferral and retirement solutions. Our customized solutions for overall retirement readiness include 401K plans, profit sharing plans, ESOPs, nonqualified deferral plans and stock bonus plans. Our process and service model recognizes that business owners need a strong advocate in today's complex retirement environment. Our role typically grows as clients migrate over time from a passive "Sponsor" role to more "Guide" role and perhaps to that of a "Strategic Advocate". See graphic below. 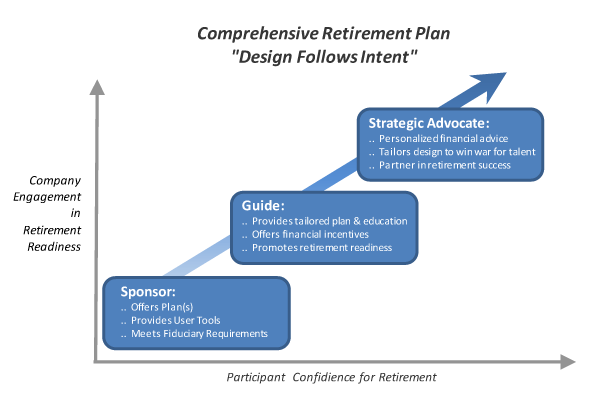 As these roles evolve, we find that our clients are increasingly involved in retirement outcomes and ownership succession solutions through designs such as ESOPs or SERPs. If you would like to see our 401K Scope of Services, please contact us. Come bring us your questions in this critically important area.